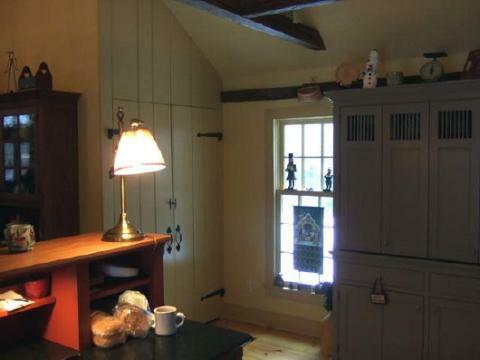 A very concise work triangle incorporating three super- efficient unfitted workstations was designed for this 1770 farmhouse kitchen renovation. Three other pieces add specialized functions to nearby areas as well. And this is one of the advantages to using furniture instead of laboratory-like cabinetry for period style renovations. Fitting separate pieces, with different styling, sizes and functions into the fabric of often very cut up but interesting floor plans is just what Kitchen Workstations are meant to do. A SZ20-RP-36 Colonial Pine stained Armoire hides the large Subzero 700 refrigerator/ freezer, and an Ox Blood painted TP72-MH/B72-OC Range/ Breakfront conceals the microwave oven/hood and another wall oven. The black ceramic cooktop blends in with the honed black granite countertop. The Ox Blood painted S2-89A Island Sink workstation features a soapstone sink, a hidden dishwasher and a honed black granite top. The ST2-89A Storage unit above the countertop hides the messy work areas from view from the family room, and its cherry countertop reinforces its furniture quality. The range and sink workstations are extra deep, creating more efficient countertop space and larger storage areas as well. This view from the entrance to the home instantly includes the Washington Cherry stained CB48/B48 Hutch that is used as a buffet and storage piece. Since it is near the laundry room (around the corner) the hutch includes a fold-out ironing board in one of its drawers. A few steps away is a large Taupe painted WP54 Working Pantry Armoire that conceals a countertop and all the small electrical appliances. This ‘catch all’ unfitted piece eliminates the need for long runs of above counter wall cabinets. In addition, the freestanding piece fits neatly between two double height windows. The laundry was concealed in a closet with planked doors. A C32-20D Deep Ocean Green Secretary desk with its fold-down worktop conceals a computer and filing storage. 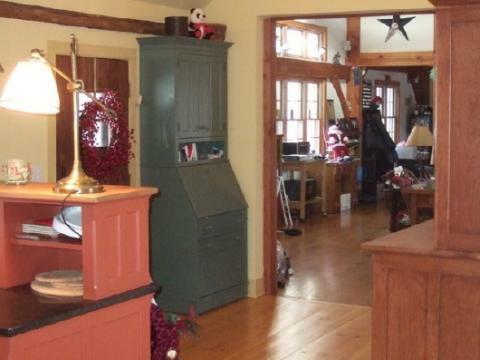 The family room beyond the kitchen is a 1998 timber framed addition. 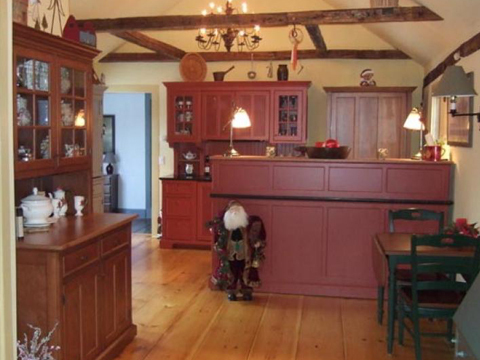 Please click here for more information about this Farmhouse Kitchen.